Denny Triangle, or as it is sometimes known, the Denny Regrade, is a roughly triangular area in downtown Seattle. It has no official borders, but is adjacent to (and sometimes part of) Belltown. Its borders are generally considered to be Denny Way to the north, I-5 to the east, Western Ave. to the southwest, and Stewart St. to the southeast. Denny Triangle, like a lot of Seattle, was once a steep hill; the "regrade" project of the 1900's turned it into the flat, residential area it is today. Though small, the area still offers plenty of condos for sale that range in style. 3 Beds | 2 Baths | 1518 sq. Ft.
2 Beds | 2 Baths | 1359 sq. Ft.
2 Beds | 2.5 Baths | 1732 sq. Ft.
2 Beds | 1.75 Baths | 1415 sq. Ft.
3 Beds | 1.75 Baths | 1523 sq. Ft.
2 Beds | 1.75 Baths | 1316 sq. Ft.
1 Beds | 1 Baths | 940 sq. Ft.
1 Beds | 1 Baths | 859 sq. Ft.
2 Beds | 2.5 Baths | 1284 sq. Ft.
2 Beds | 2 Baths | 1115 sq. Ft.
2 Beds | 1.75 Baths | 1388 sq. Ft.
Blue Summit Realty has the most accurate and up to date Denny Triangle real estate listings on the web. Currently there are 18 condos for sale, in Denny Triangle. Of the 18 total Denny Triangle residential listings for sale 0 are bank owned, 0 are short sales, 0 are new construction, and 0 are townhomes. The price ranges from $539,000 to $0 with a median list price of $1,284,872 and median sold price of $650,456. 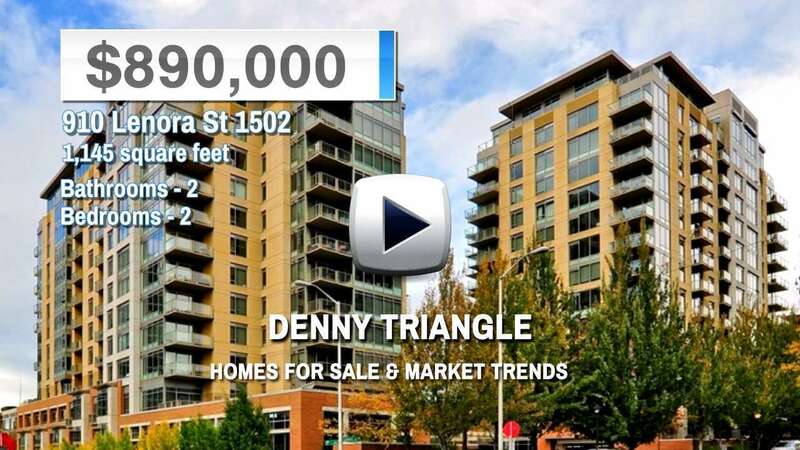 Make sure to refine your Denny Triangle real estate search by property type, price, square footage, bedrooms, bathrooms and more with the search tool above or view the Denny Triangle listings on our interactive map. Our Denny Triangle real estate listings were updated 12 minutes ago.